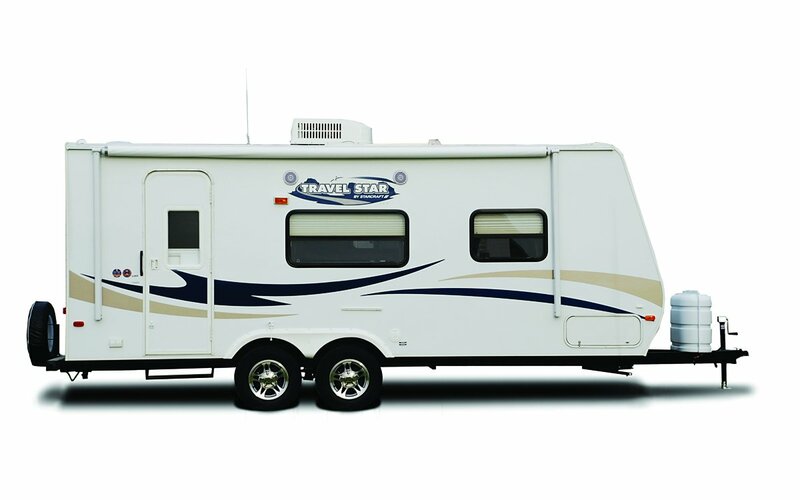 Travel Trailers come in two classifications: less than 4,000 lbs. and more than 4,000 lbs. This class of trailer is designed to be hauled behind the average family car, minivan, SUV or other small vehicle that’s properly set up and factory-rated for towing. Most such trailers are fully-equipped like their big brothers, but they’re smaller and most facilities are downsized to fit the compact space. You may not get a lot of lounging or bathroom space and the kitchens are usually functional but not extra roomy, but these rigs include full comfort and livability hardware such as a furnace, an on-demand water system and so on. Storage and parking is less complex with a smaller trailer, but some cargo capacity and general elbowroom are sacrificed in the interest of smaller size. Keep an eye on the larger units in this class. Some manufacturers list their dry weight RVs as “less than 4,000 pounds” but by the time you start with a 3,800-pound “dry” weight and add options, fluids and cargo, the true weight is considerably more. Be careful, or you’ll overload that rig rated for 4,000 pounds in a hurry. These are among the most popular RVs on the road. They’re fully equipped, have a wide variety of floorplans aimed at families or couples or anything in between, and can be had in a dizzying array of price/quality levels, sizes and options. You don’t need a pickup to tow a travel trailer. Many full- and mid-size family vehicles can be set up for safe and sensible towing, and there’s likely a trailer out there that fits your needs. Some travel trailers can, under certain conditions, exhibit an occasional tail-wagging sway that can lead to uncomfortable moments for the driver. That’s why, all other factors being equal, many users choose a fifth-wheel. However, if a pickup is your tow rig of choice, a travel trailer leaves the pickup bed free for hauling extra cargo in weatherproof security under a bed canopy. Some people find backing a trailer difficult and hitching up a chore, but backing gets easier with practice — as does hitching and unhitching.